For 50 years Silentaire Technology has been producing air compressors for airbrush painting and other hobbies. What is unique about Silentaire compressors is their quiet operation. The company manufactures durable, reliable, trouble-free, and compelling products for any needs. Silentaire Technology includes the product lines like Scorpion Compressors, VAL-AIR Compressors, Super Silent Compressors, and many others. All the devices are available in oil-lubricated or oilless applications. More than that, the company has designed a refrigerated dryer that removes damp from the air. Read the following information to learn more about Silentaire BA-AMD10-4 Refrigerated Air Dryer. The compressed air contains moisture and pollutants, and thus, it’s essential to remove them as they can cause damage. A refrigerated air dryer cools the air to almost 36°F (2°C) to ensure the efficient operation of the machine. Then, the dryer dehumidifies the compressed air and delivers purified, dry air required for the normal functioning of your air compressor. This technical function also serves to hold the dew point on the same level. Most noteworthy, refrigerated air dryers are efficient, handy, and powerful devices that help to prevent air contamination in your room. The filters, installed in the items, provide dry and clean air. 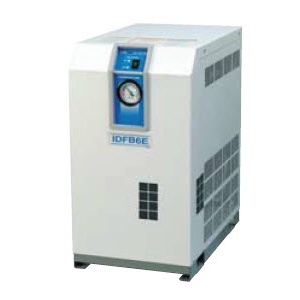 Refrigerated air dryers are suitable for dental, food, labs, and medical applications. At first, the device is environmentally friendly. Plus, the air dryer has a simple control system with the evaporator gauge for easy control. The heat exchanger, made from stainless steel, provides a long service life of the item. Additionally, the device has the outlet/inlet ports for simple installation. And finally, the BA-AMD10-4 model comes with the ⅜” push-in condensate drain port. 18.6" x 16.1" x 8.9"